If you follow my posts you know that i have this crazy part time job that involves working nights. And if you know me i am not a night person, so the morning when i get home i crash hard…. and this half a century plus body just craves to catch up on the lost sleep of the night before. But i am so conflicted because i have a thousand things calling for my attention – including the tyrany of the urgent. So here i was, sleeping until 2pm (that is actually only 6 hours) and hit the ground running when i got up. I hand dyed 6 scarves. 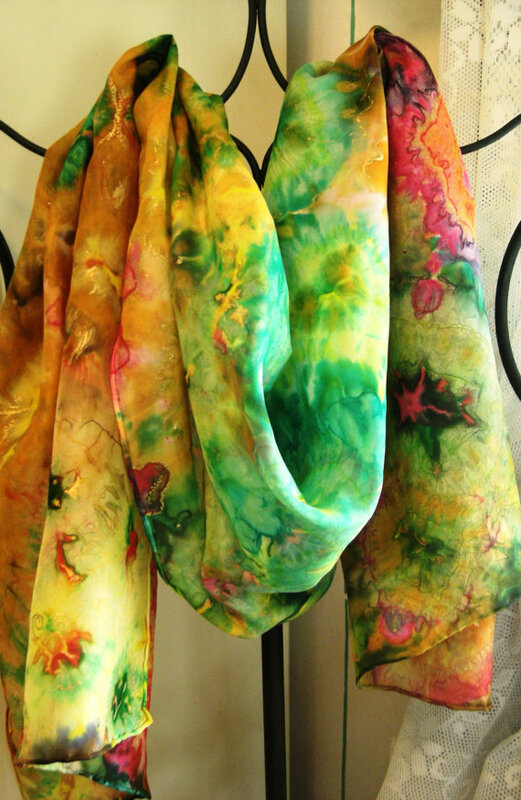 Months ago I made a scarf that i initially did not like… i called it Monet’s Electric Garden because the colors were bright, and a rainbow. But it was a big hit, and i have actually been asked if i can duplicate. So Monet’s Electric Garden II worked out amazing. (Photos to follow). Another very popular pattern is in shades of blue, and a traditional shibori pattern known as the storm. Every time i duplicate that scarf it sells fast… so we are up to Storm VI… again, photo to follow. The time consuming part of dying is tieing the silk in preparation. which took several hours for just 6 scarves. Another fun thing i love to do is to use rubbing alcohol rather than water to dilute my dye. It is a little secret- the colors are more vibrant, and the silk dries faster. Rubbing alcohol also causes the dye to run differently and break in unusual ways. i just love the results and can hardly wait to post photos. But the real labor comes after removing the binding, when i add metallic resist. this can be hours on one scarf. today i did not add alot of resist… just small embellishments. While i was working on my silk the house filled with lucious fragrance of another 2 batches of Steve’s soap. He is steadily producing batches of soap to keep our stock levels high enough to get through to christmas. And that is an unending process. Sleeplessness – so all said, my circadian rhythms are off kilter, and here it is 5:20am but i am wide awake. Part of the awakeness is over stimulation on ideas, and creative energy…. but all said, i am going back to bed for a few hours so i can function through theday like most of the world.